Why I Bought More Shares of Amazon.com Inc. I just picked up some more shares of this e-commerce giant for three main reasons. Investors loved Amazon (NASDAQ:AMZN) last year, bidding the stock up to an all-time high near $700 by the end of December. Unfortunately, that bullish sentiment didn't last, and the stock has tumbled nearly 20% since the beginning of the year. A surprising miss on both the top and bottom lines during its fourth quarter earnings on Jan. 28 doused hopes of a recovery, and the stock slid to the low $480s by early February. But instead of selling my position in Amazon, I took my own advice and bought some shares on that recent dip. Here are my top three reasons for doing so. Amazon's revenue rose 22% annually to $35.75 billion last quarter, which missed estimates by $180 million. However, that figure represents a significant improvement from its 15% sales growth in 2014. Amazon's net income soared 125% to $482 million, or $1 per share, which missed expectations by $0.56. In my opinion, that earnings "miss" should be attributed to overly bullish analyst expectations instead of a meaningful slowdown in Amazon's top and bottom line growth. Analysts currently expect Amazon's revenue to rise 21% this year and 19% next year -- impressive growth figures for the world's largest retailer by market cap. Its earnings are expected to grow 266% this year and another 90% next year. That bottom line growth is expected to be fueled by the strength of its high-margin cloud business. It also represents remarkably consistent growth for a company which struggled with profitability over the past few years. A common bearish argument against Amazon is that the stock is too "expensive" at 443 times trailing earnings, which is more than ten times the industry average P/E of 43 for the catalog and mail order houses industry. But if we look forward and assume that Amazon can keep growing its earnings, its forward P/E of 64 looks slightly more reasonable. 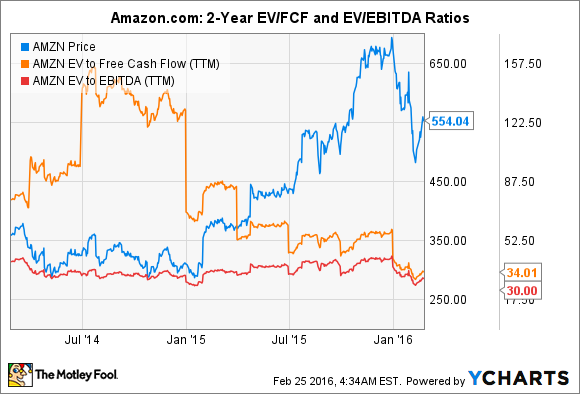 For companies like Amazon, which prioritize generating top line growth and enough free cash flow to expand its business, EV/FCF and EV/EBITDA ratios generally paint a more accurate picture of how "cheap" the stock actually is. Based on those figures, Amazon stock is hovering near its cheapest level in about two years, although its price has soared 55% during that period. By comparison, shares of Alphabet, Google's parent company, have risen 18% during that period, and it has respective EV/FCF and EV/EBITDA ratios of 26.6 and 17.3. While Alphabet still looks "cheaper" based on those metrics, the valuation gap between the two tech giants isn't that wide. The main reason Amazon's bottom line has stabilized is the growth of AWS (Amazon Web Services), its IaaS/PaaS cloud platform. Last quarter, AWS revenue rose 69% annually to $2.4 billion and accounted for 7% of Amazon's top line. On the bottom line, operating income surged 161% to $687 million, accounting for 39% of Amazon's operating profits. AWS finished the year with an annual run rate of nearly $10 billion, making it the largest IaaS/PaaS cloud platform in the world. Its closest cloud rival is Microsoft (NASDAQ:MSFT), which finished last quarter with an annual run rate of $9.2 billion for its "commercialized cloud" business. However, most of that revenue came from slower-growth SaaS solutions like Office 365 and Dynamics CRM, which don't compete against AWS. Microsoft didn't disclose the run rate for Azure, which competes against AWS, but Forrester Research estimated that the unit had a run rate of just $1.6 billion last October. During 2015, Amazon widened AWS' moat against Microsoft and other rivals by adding 722 new features to AWS -- a 40% increase from 2014. Morgan Stanley analyst Brian Novak estimates that through 2017, AWS' weight on Amazon's top line will eventually double and generate about 60% of Amazon's incremental profits. Amazon's earnings growth, historically low valuation, and cloud growth were my top reasons for buying more shares on the dip, but they certainly aren't the company's only strengths. Its prisoner-taking Prime ecosystem continues to grow, with Consumer Intelligence Research Partners (CIRP) recently claiming that total U.S. members rose 35% over the past year to around 54 million. CIRP also estimates that Prime members spend around $1,100 annually, compared to just $600 for non-members. Amazon's aggressive expansion of Prime-tethered services and devices like the Kindle, Fire TV, Dash Buttons, and Echo will also widen its moat against brick-and-mortar and e-commerce challengers. Therefore, I believe that investors should buy more shares of Amazon during the current lull if they believe in the long-term growth potential of its cloud and e-commerce engines.